Abstract: Ocular surface squamous neoplasia (OSSN) refers to a spectrum of conjunctival and corneal epithelial tumors including dysplasia, carcinoma in situ, and invasive carcinoma. In this article, we discuss the current perspectives of OSSN associated with HIV infection, focusing mainly on the epidemiology, pathophysiology, clinical manifestations, diagnosis, and treatment of these tumors in patients with HIV. Upsurge in the incidence of OSSN with the HIV pandemic most severely affected sub-Saharan Africa, due to associated risk factors, such as human papilloma virus and solar ultraviolet exposure. OSSN has been reported as the first presenting sign of HIV/AIDS in 26%–86% cases, and seropositivity is noted in 38%–92% OSSN patients. Mean age at presentation of OSSN has dropped to the third to fourth decade in HIV-positive patients in developing countries. 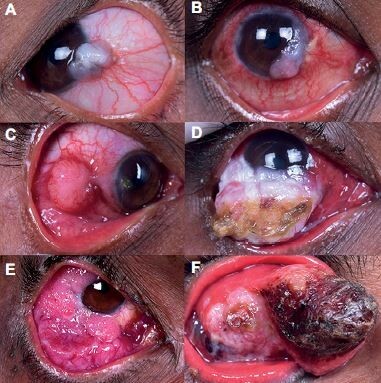 HIV-infected patients reveal large aggressive tumors, higher-grade malignancy, higher incidence of corneal, scleral, and orbital invasion, advanced-stage T4 tumors, higher need for extended enucleation/exenteration, and increased risk of tumor recurrence. Current management of OSSN in HIV-positive individuals is based on standard treatment guidelines described for OSSN in the general population, as there is little information available about various treatment modalities or their outcomes in patients with HIV. OSSN can occur at any time in the disease course of HIV/AIDS, and no significant trend has been discovered between CD4 count and grade of OSSN. Furthermore, the effect of highly active antiretroviral therapy on OSSN is controversial. The current recommendation is to conduct HIV screening in all cases presenting with OSSN to rule out undiagnosed HIV infection. Patient counseling is crucial, with emphasis on regular follow-up to address high recurrence rates and early presentation to an ophthalmologist for of any symptoms in the unaffected eye. Effective evidence-based interventions are needed to allow early diagnosis and treatment, as well as prevention of the disease.